My friend, colleague, and 282 host Carlton Hargro is diving into one of his first loves: comic books. He's collected them since he was a kid and even used to write them before he got heavy into his journalism career. Now as a freelancer and with more time and flexibility, Carlton has began working on a new comic book tentatively titled The African American Superhero Anthology. Carlton hangs out at local comic book stores--Heroes, to be exact--and attends conventions like Comic-Con, so he's never lost his passion for the art. But he feels now is a good time to strike with his venture because of the prevalence of comic book characters in pop culture. Just look at all of the Marvel Comics stories that have been made or remade into blockbuster movies in recent years, with several more on the way (The Avengers hits theaters next month). But as Carlton points out, very few of these comic book characters, whether in print or on the big screen, are people of color. They're fictional, after all, so why not add more black characters? 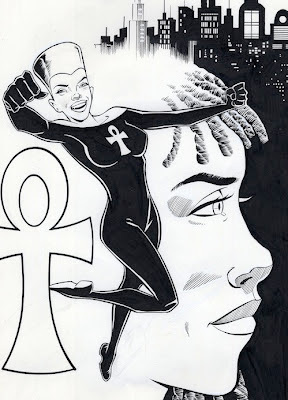 Isis is a character by Image Comics artist Jimmie Robinson, scheduled to be featured in the anthology. The African American Superhero Anthology is designed to introduce a bevy of new and divergent heroes of color to the comic landscape, Carlton says. And you can support his cause by making a financial pledge to his Kickstarter campaign for the project. If you pledge $5 or more, you'll receive a special edition of The African American Superhero Anthology, featuring a special cover and autographs from all the creative teams involved. Carlton actually reached his fundraising goal of $3,000 today, after only eight days. But with a month left to go on Kickstarter, you have the opportunity to give to this project so that the creative teams will have a more ample budget to work with. Click here to make your pledge today.